What Is Better: Dental Implants Or Dentures? In case you lose a tooth or two, it is of utmost importance to get them replaced. Losing teeth might become problematic as you may experience problems while chewing and churning the food. A person might also start to feel under-confident on missing a tooth and refrain from public speaking and mingling. There are two options of correcting this issue, i.e. getting treated with dental implants in New Hyde Park or getting dentures. Paying attention to the condition of your teeth is of utmost importance as it has a considerable amount of effect on an individual’s overall health. Teeth form an integral part of the human body. They play an essential role in churning the food into bits for easy digestion. Thus, if you miss a tooth, it will certainly impact the chewing capacity and affect health. You might also experience speech problems. Thus, it is important to consult a doctor to get the right treatment option. The doctor will study your problem areas first and then take out X-Rays. After fully assessing the tooth, the dentist will plan your treatment according to the level of damage and your overall health. Dental implants can change the way you look. Missing teeth can prove to be very unhealthy for your mouth. It can have a considerable amount of impact on the overall health of a person and the self-esteem of an individual. There are various methods of correcting this such as dental implants, dental dentures, tooth restoration methods, and precautions. One must understand what is best for his/her teeth and health and take prior corrective measures. North Island Dental Arts expertise in lending the best dental care to patients. We possess the most experienced and professional dental care experts who will tend to all your dental issues. What are dental implants and dentures? Dental Implants: Dental implants can be carved out of titanium or zirconium materials. These are attached with the jawbone in order to perform the function similar to that of a tooth root. 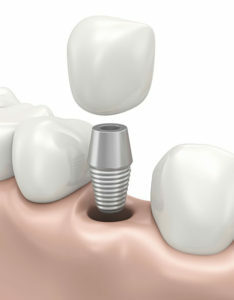 To close the cavity, the implant is fitted with a cap. Dental implants look and feel like natural teeth. Dentures: Dentures are artificial fixtures designed to support the teeth and gums. Some part of the surrounding is removed from the tooth in order to fix the denture in the patient's mouth. When a person loses all teeth, dentures come in handy. Reliable and durable: Getting dental implants is a great way of ensuring good tooth health. It is a durable and the most effective method of curing missing tooth. It is a permanent solution to get a bright white smile. Functional benefit: One can experience a plethora of benefits with the help of dental implants. These implants feel completely like normal teeth and offer various functional benefits in chewing, churning, and health management. One can consult a dentist in Long Island for examination and treatment. Hygienic option: Dental implants are easy to brush and floss. They are completely like natural teeth but some precautions have to be taken for the upkeep of dental implants and their maintenance.